With special end-of-year funding, the Clarke Historical Library recently added to its collection of Native American images four new lithograph prints created early in the nineteenth century. Images were acquired of the Sioux Chief Little Crow, Caa-Tou-See, identified as an Ojibway (seen at right), Tshusick, an Ojibway woman who visited Washington, D.C. (seen below), and an unnamed Ojibway woman nursing an infant. 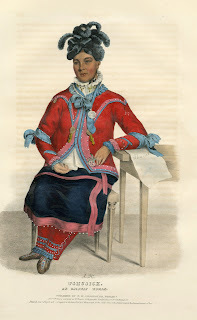 What is particularly significant about these, and the other similar images within the Clarke’s holdings, is that they were all created from life and are the most accurate known images of the people, their dress, and occasionally their culture. The story of their creation, and publication, is a complicated one. The United States government allowed Michigan Territorial Governor Lewis Cass to employ an artist to go with him to several important Midwest treaty negotiations during the 1820s. The resulting images were both preserved in Washington, and of even greater importance, eventually printed and distributed by two different publication projects. J.O. Lewis’ Aboriginal Port Folio first appeared in 1835. Lewis had been the artist who had accompanied Cass. Lewis's plan was to issue eight images a month over a ten month period. Seventy-two plates were certainly issued and received modest circulation. But the project ran into deep financial difficulty and the final eight prints, while copies do exist, today are extraordinarily rare. Lewis's original paintings were sent to Washington, where they, and many other portraits that the government had commissioned, were prominently displayed by Thomas McKenney, United States Commissioner of Indian Affairs, from 1824 to 1830. Like Lewis, McKenney believed that there was a market for high quality, printed color copies of the images. 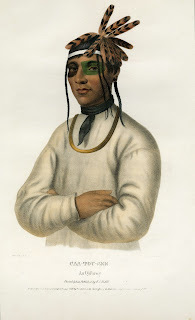 In 1836, McKenney and James Hall, who wrote the text that accompanied the images, began to print their, History of the Indian Tribes of North America. The 121 images in this publication had national scope that incorporated, but went beyond, the Lewis Port Folio. Unlike Lewis, the McKenney and Hall work was a financial success and was republished in several editions. 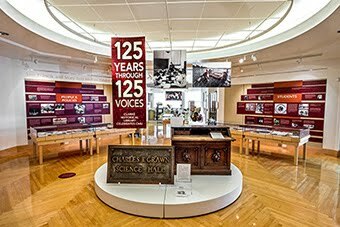 The original art that underlay both the Port Folio and the History of the Indian Tribes eventually found its way to the Smithsonian. Those works of art were all destroyed by a massive fire that swept through the Smithsonian Institution building in 1865. Today, the most detailed portraits of Native American leaders who helped shape our nation in the early nineteenth century are preserved through the prints originally found in these two publications. To easily see the many portraits and other images the Clarke holds from these two publications, click on the link below to visit our website. https://www.cmich.edu/library/clarke/ResearchResources/Native_American_Material/Treaty_Signers/Pages/default.aspx. To see the actual images, visit us in person. It’s worth the trip.